Riley Barber, of Albert Pye Primary School in Beccles, received the Emma Holloway Foundation Outstanding Achievement Award, after the nine-year-old’s confidence was boosted by competing in Panathlon events. Neil Holloway, from the Foundation, handed over the trophy (pictured above), which recognises young people’s achievement in overcoming challenges that exist in their life and how their involvement in Panathlon has helped create the change. 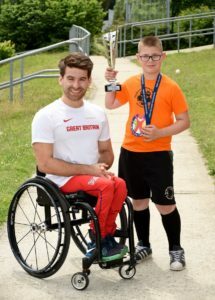 The Suffolk youngster was also presented to Team England wheelchair racer Will Smith (pictured left) as Riley’s school won the North Suffolk Primary Panathlon in Lowestoft. When Riley was a toddler, his parents were told that his dyspraxia and learning difficulties would prevent him from reaching many physical milestones unaided, such as riding a bike. However, his participation in Panathlon events has helped him far exceed medical expectations and become an inspiration to other pupils. His confidence has soared to such an extent that he has had less one-on-one support in class and he has taken it upon himself to try to achieve academically as well. His mum, Clair Webb, said: “I am extremely proud of Riley. He has grown in confidence ever since he started doing Panathlon events and this has been the first chance for him to represent his school in sport. Riley’s school sports instructor, Stuart McKenzie, praised him, saying: “Riley loves all sports and has previously turned up for every trial in every competition. “He comes to every event, is always enthusiastic and doesn’t take no for an answer. It has also allowed his grandparents see him compete, something they thought they would never see.